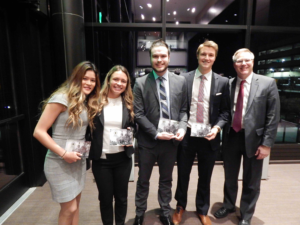 Marketing students from Drake University and Creighton University traveled to Minnetonka, Minn., Nov. 15–17 for the sixth annual Murphy Cup, a marketing student case competition. Students worked in teams to develop strategies for positioning the corporate brand for UnitedHealth Group, the largest healthcare company in the world and the fifth-ranked company on the 2018 Fortune 500. An all-Drake alumni team of marketing executives, including chief marketing officer Terry Clark, JO’88, judged the teams based on the strength of their plans for two different challenges: create a compelling brand positioning proposal focused on advancing the UnitedHealth Group brand and develop a marketing strategy that will establish UnitedHealth Group as a global champion of health literacy. UnitedHealth Group hosted the Drake and Creighton students at their corporate facilities and were on hand the entire time, serving as coaches and mentors to the students during the competitive process. The Murphy Cup is the vision of Drake University alumnus Chris Murphy, a member of Creighton’s Board of Trustees and owner of the Ameriwest Corp holding company and First Westroads bank in Omaha, to hold an annual marketing strategy competition featuring top marketing major seniors from Creighton and Drake. Murphy made a substantial donation, along with funds donated by UnitedHealth Group, to make this event possible, covering all event expenses and accommodations. Each year, twelve senior marketing majors are chosen by the marketing faculty to represent each school. This year’s students from Drake included Linda Fiorito, Alex Peterson, Kassy Blaschak, Noah Marsh, Maddy Mueller, Carmen Ong, Cole Horton, Jack Kennedy, Macy Nossaman, Maria Comito, Caroline West, and Kaitlynn Osborne. “We’ve designed this to be a truly unique event and an experience that will stand out as a highlight of these students’ college career,” said Andrew Norman, professor of marketing at Drake and organizer of the event. One of the key features of the Murphy Cup as a case competition is the organization of competitive teams. Rather than having teams from Drake compete against teams from Creighton, six four-person teams composed of two students each from Creighton and Drake compete against each other. The purpose of this is to foster collaboration between the neighboring schools while at the same time pressing students to compete at the highest levels of their academic fields. Another key element of the event is the participation of a corporate client. Students were given background reading material on UnitedHealth prior to the event. On the bus ride from Drake to Minnetonka on Thursday afternoon, students were assigned to their teams. The next day, each team was then given work space where members worked non-stop until midday on Saturday to prepare their plans. Each team had 20 minutes to present their proposal to the judging panel. On this year’s winning team were Linda Fiorito, who also was honored as the year’s Most Creative Contributor, and Alex Peterson. Noah Marsh was named Most Knowledgable Contributor. All students received keepsake items commemorating the event.